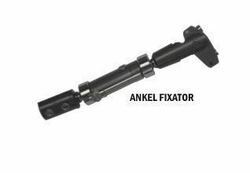 Leading Manufacturer of ankel fixation system and external fixator for ankle from Pune. Due to our rich experience and vast knowledge of this domain, we have been able to offer optimum quality Ankle Fixation System to our valuable customers. Manufactured in adherence to the international quality standards, these systems are known for their easy operations and longer functional life. The offered systems undergo various quality assurance procedures, in order to ensure a flawless range. We hold expertise in manufacturing, supplying, exporting and wholesaling External Fixator for Ankle. Our offered range is designed and developed with the aid of modern machinery and technology that is installed at our infrastructure unit. Apart from this, to meet the exact demands of customers, we work in close coordination with them.